Actively involved in the manufacture of high quality scopes for hunters, beginners and professionals alike, Prism Arms is known since the year 2007 for its outstanding lineup of a wide range of scopes such as rifle scopes and optics for hunting, shooting and other tactical purposes. Primary Arms has got everything you need as a professional shooter, a field agent or a wild life ranger. Their good reputation is also established by the manufacture of different products built from top quality and durable materials to deliver high performance to make your passion and profession one of a kind. 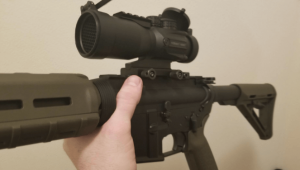 One of their reputable products is the Prism Arms 5X compact prism hunting Scope (5.56 reticle) which we’d take a good look at in our review. We intend to give a well detailed product specifications, key features and pros and cons of the product. This we believe should guide you into making a better decision should you think it is the best bang for your buck. Who is the Prism Arms 5X hunting scope for? 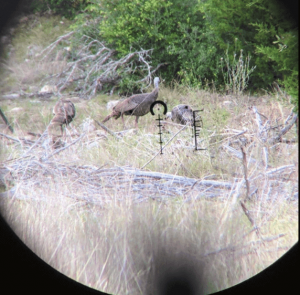 This scope is made available for hunters involved in day or night hunting and for the different forms of hunting you may choose (stalking, blind or night). Prism Arms 5x scope has also found a wider use among tactical operatives, outdoors men and for sport shooting for beginners and professionals. Prism Arms 5X hunting scope is engineered with specific details to ensure a high degree of performance and durability. Built with aluminum, Prism Arms 5X scope is known for its standard ACSS reticle which provides a good range view and target point for shooting. The reticle is the etched type which is leading other reticle types in the market today. The ACSS reticle is darkened except for the centre point usually lighted at 5 red and 5 green brightness levels by a CR2032 battery. The scope is compatible with arms like the .223 Remington and .308 Winchester. The hunting scope has a fixed 5X magnification which allows for an easy target acquisition. With the included Picatinny mount, you can quickly install the scope on your firearm in time to get a lock on your target, but with other mount types like the Quick detach (QD) and ACOG, the scope can also be used on flat top style rifles. The Prism Arms optic is durably built with waterproof, shock and fog resistant materials to withstand harsh weather conditions. The optic has a black anodized matte finish which gives an appealing outlook for the durable product. Prism Arms 5X compact prism hunting scope is designed with high end features for a great performance. The scope has an illuminated and non-illuminated setting for use in broad daylight and even at night. You can easily switch between the 5 dual red and green Nitrogen illuminations to get a crisp, clear and bright lighting for target locking. 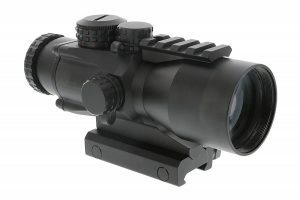 The optic features a ranging glass, clear and of high quality with the reticle etched within its prism. This quality of the reticle makes it ideal for bullet drop compensation and range estimation especially for targets over a long distance. The scope is also perfect for flat topped rifles and has a removable base for easy use on carry handles. Also included as part of the scope is the front and rear flip up caps that protects the scope lens especially when not in use. Prism Arms 5x has a great eye relief for users comfort. It is also fog resistant and waterproofed, thus ensuring its safe use especially in extreme weather conditions. Q: How heavy is PA5X compared to ACOG? A: Prism Arms 5X weighs 17.6oz, quite heavy but can be managed since you won’t be carrying it all day. 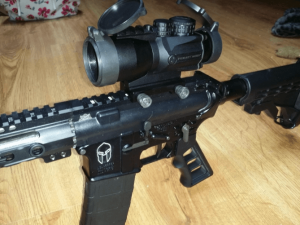 Q: Can PA5X work with ACOG mounts? A: Yes, PA5X is designed to be easily used with ACOG mounts asides its Picattinny mount. Q: Why is there illumination on the centre dot and horse shoe rather than the usual BDC? A: This is to ensure precision and a faster close quarter. Q: Does PA5X work for a 556 caliber? Q: Can this optic compare to the ACOG’s durability and ruggedness? A: Depending on the type of mount, PA5X is built to withstand fair to extreme use without break. Q: Is the PA5X reticle visible with illumination? A: Yes. PA5X can be illuminated by two colors and it is visible either ways with a clear glass. Q: What part of the optic does the battery light up? A: The battery works for the horse shoe and the black dot only. Q: What is the battery life of this optic? A: The battery lasts between 150-200 hours when used on low settings and occasionally medium. Q: Can the optic be used without battery? Yes. The 5X optic has a reticle that requires no illumination. Prism Arms 5X is a great optic sold at a good price, a balance between quality and affordability. If you are still waiting to make a final call on the best scope, we recommend Prism 5X optics. The crystal clear glass, etched reticle and fast target acquisition among other great features makes it a great alternative to ACOG optic. We shouldn’t forget the 3 year warranty you get on the scope, an assurance of a long-term durability. So if you want an ACOG scope so badly yet you can’t afford it, your very next choice should be Prism Arms 5X scope. You’d be glad you made the investment.